The current state of US politics is giving me the fear. The usual explanations explain nothing. And so we must look to literature and fantasy to understand our new reality. And when it comes to the deep weirdness that lies at the heart of America, there are only two authors that really knew the score: H.P. Lovecraft and Hunter S. Thompson. Although these two authors are not often mentioned in the same breath, they are startlingly similar in tone. Both used violent and overblown language to communicate a sense of moral decay that transcended the ordinary boundaries of acceptable thought. Both sought to portray how a reasonable mind twists and melts when exposed to a horrific reality. Both saw barbarism beneath a hypocritical veneer of American modernity. And both H.P. Lovecraft and Hunter S. Thompson were past masters at portraying altered states of consciousness. For Lovecraft, this came in his Dream Cycle stories like The Dream-Quest of Unknown Kadath (1926) or The Silver Key (1926). For Thompson, it was his drug-fueled romps like Fear and Loathing in Las Vegas (1971) or the under-appreciated gem, Fear and Loathing in Elko (1992). In these works, Thompson and Lovecraft drag their benighted narrators through a phantasmagorical landscape populated by monsters and madmen. Indeed, sometimes it's hard to tell the two authors apart. But maybe that's the drugs talking. Well, in any case, listening to the audiobook of Thompson's Fear and Loathing on the Campaign Trail '72 has given me some solace in understanding the last American election. It's also kept me busy while painting some miniatures for The Dreamlands, the latest expansion for Eldritch Horror, the Lovecraft themed board-game. 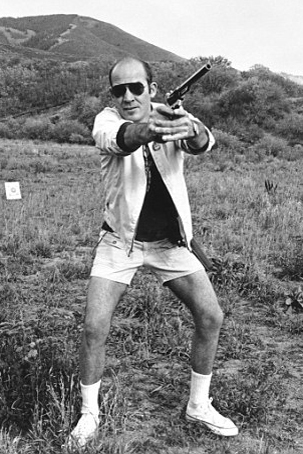 This is my ode to Hunter S. Thompson. With his shorts, cigarette, revolver and high socks, I tried to capture Thompson's odor of violent and disreputable journalism. The miniature is not really from the Gothic Horror range -- originally, he was "Nyudo" (1985) from Citadel's Judge Dredd line. 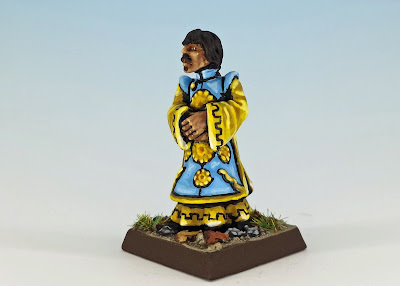 Nyudo was an almost unbelievably racist miniature in his pristine form. Apparently an Asian tourist, he featured slanted eyes and buckteeth. Well, so much for that - I cut off Nyudo's head and hand, replacing it with bits from a Citadel gangster. I think Hunter would be proud. Amanda's miniature is the "Office Girl" (1987) from Citadel's Gothic Horror range. I'm close to exhausting Citadel's fund of female heroes, so this miniature is a GN7 "Gun Moll" from Copplestone Casting's Gangster line. I'm glad that Fantasy Flight Games has continued the long tradition of Jewish investigators in Cthuloid activities. Gloria's miniature is another Copplestone Casting, from GN11 "Swell Dolls". Some days you eat the bar and some days the bar eats you. When it came to creating a miniature for the scientist Kate Winthrop, I got eaten. Jesus, this is a bad conversion. She started out as another Copplestone GN11 "Swell Doll" but after I replaced a number of her limbs, she now looks more like a goiter with big hips. At least she's wearing a lab-coat so that you know that she's a scientist. She an expert in science. Although this miniature isn't a particularly good likeness of Vincent Lee, it's such a beautiful sculpt that I can't resist using him in this role. 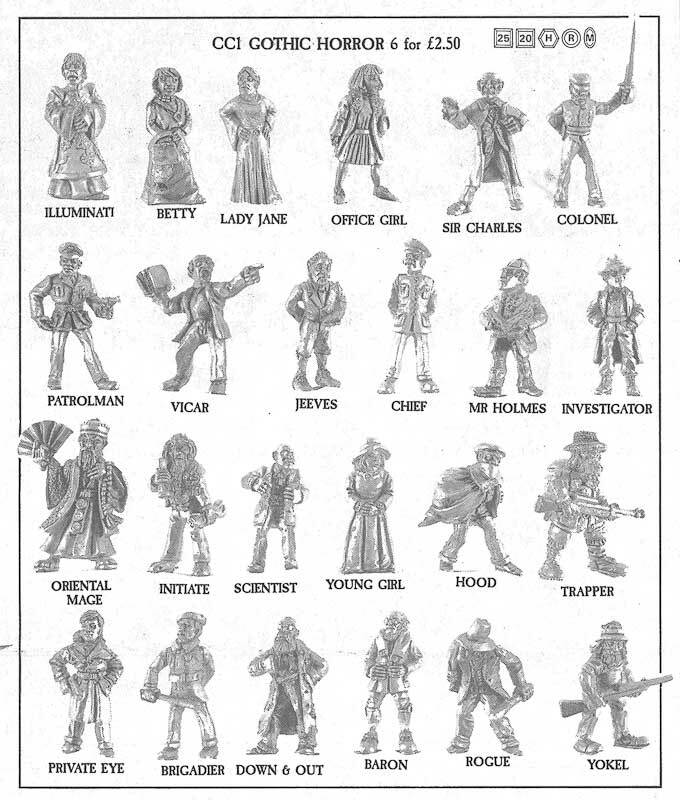 The mini is "the Doctor" from Wargames Foundry's Old West City Slickers range. God gave me a gift. I shovel well. I shovel very well. And I intend to use my shoveling abilities to fight the Great Old Ones. Whatever. 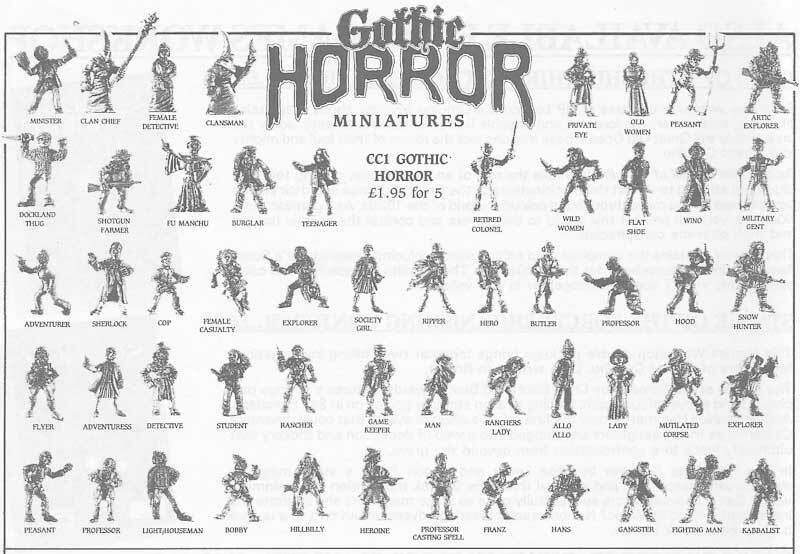 Poor Yorrick's miniature is the "Man" (1987) from Citadel's CC1 Gothic Horror Range. Luke Robinson is clearly a stand-in for Lovecraft's dream-questers like Randolph Carter, Kuranes or Raoul Duke [ed: fact check, pls]. His miniature is one of the rarities from Citadel's Gothic Horror range, the Illuminati (1987). Variants of this miniature also appeared as Wu Jen in Citadel's Oriental Heroes range. This is one of my favourite miniatures, and I'm pleased with the way his bright colour scheme worked out. There is no way to explain the terror I felt when I finally lunged up to the sentry and began babbling. All my well-rehearsed lines fell apart under that woman's stoney glare. "Hi there," I said. "My name is ... ah, Randolph Carter ... yes, on the list, that's for sure. Free lunch, final wisdom, total coverage. ... why not? I have my attorney with me and I realize of course that his name is not on my list, but we must get into Kadath, yes, this man is actually my driver. We brought this red shark all the way from Leng and now it's time for the desert, right? Yes. Just check the list and you'll see. Don't worry. What's the score, here? What's next?" The woman never blinked. "Your chamber's not ready yet," she said. "But there's somebody looking for you." "No!" I shouted. "Why? We haven't done anything yet!" My legs felt rubbery. I gripped the desk and sagged toward her as she held out Silver Key, but I refused to accept it. The woman's face was changing: swelling, pulsing ... horrible green jowls and fangs jutting out, the face of a Moray Eel! Deadly poison! I lunged backwards into my attorney, who gripped my arm as he reached out to take the Key. "I'll handle this," he said to the Moray woman. "This man has a bad heart, but I have plenty of medicine. My name is Nyarlothotep. Prepare our chamber at once. We'll be in the bar." Fantastic work and genius thinking. Fear and loathing on the campaign trail taught me more about American politics than any other book. Try looking up 'The Kentucky Derby is Decadent and Depraved' and tell me the images he paints of the patrons don't smack of a hoard of Lovecraftian mutants on the rampage. oH... I love all Lovecraft's art and your tribute is excellent! Interesting comparison between Thompson and Lovecraft. I've never thought of it that way! Absolutely fantastic! About the literary kind of review... well, your insights are more than interesting! Now that's how to do a proper post-title. The Lovecraft/Thompson mash-ups are genius. As for the recent election, to paraphrase Kissinger, "It's a pity they both couldn't loose". Great all around. I didn't know they came out with an expansion. We played Eldritch Horror once. My only issue is I don't understand what kind of tables FFG thinks normal people have? There's no room for the board and all the cards and what not. Although I'm more than familiar with both authors, I've not heard of this game. I have a friend who would probably squeal upon seeing it though. Your minis are lovely mate. Very thematic and with some fun descriptions and conversions. 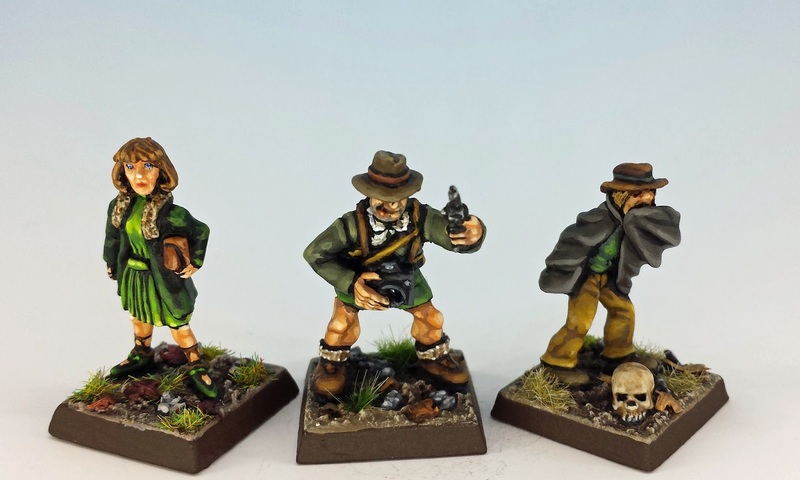 I really love the Cthulhu investigators miniatures. They have so much period character in their dress and even their poses, I think they were really well designed even if they sometimes suffer from the sculpting foibles of their era. Of course your painting really brings them to life, and I don't think your conversions are as bad as you think they are. I should read some Thompson. I really like your Gloria Goldberg! Good work on all the conversions.